Atmos Power Pvt Ltd is leading designer, manufacturer and supplier for different types of Gas Generation Plants. We are offering customize capacity of Gas Generation Plants for Nitrogen, Oxygen, Hydrogen, Biogas purification - Bottling Systems. We are following ISO coding in manufacturing & designing systems. Atmos Power Pvt Ltd Top Management has more than 20 years of experience in Chemical and Gas Generation Systems. We provide the fast solution services & best qualities to our customers. We have sufficient team, Welder, Fitter, Helper & Workers For Gas Generation Plant manufacturing. Atmos Power Pvt Ltd also provides after sales services to the industries using Nitrogen, Oxygen, Hydrogen Gas Generation Plants and Vacuum Ejector Systems. Key people Mr.B.R.Singh and Mr. N. H. Tarapore founded “Atmos Power”. ATMOS POWER PVT LTD is ISO 9001:2008 certify company.We are leading designer, manufacturer and supplier for BIO GAS PURIFICATION AND BOTTLING PLANT. We have strong technical engineering team for technical & service department.We have also satisfied customers trough INDIA for BIOGAS purification & generation of bottling plant. We offered MPSA (Minor Pressure Swing Adsorption) technology based BIO GAS purification Plant with proprietary energizer to energizes molecules and we get a better removal rate. We offered different types of capacity as per client requirements. Purification of biogas by MPSA was evaluated to produce fuel grade methane(FGM).Two different adsorbents were employed to evaluate the process performance with equilibrium -and kinetic- based adsorbents. Carbon Molecular Sieve(CMS) 3K was employed as the example of a kinetic adsorbent because methane diffusion is extremely small.A five-step cycle configuration(Feed,Intermediate depressurization,Blow down,Purge & Pressurization) was employed to compare with results obtained with a four-step cycle without intermediate depressurization.The effect of different operating variables like step times & pressure conditions of the cycle was analyzed. 3) Protection against process disturbances & better management routines to avoid process problems. 4) Detailed process monitoring & diagnosis leading to a cost efficient plant operation. 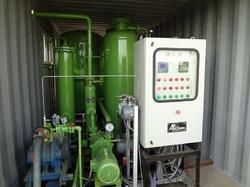 5) A faster Start-up of bioreactors. Our organization is engaged in offering high quality of Gas Generation Plants which is designed in order to fulfill the requirements of several industries throughout the country. These Dryers and Generators are manufactured by our well skilled team of experts by using superior quality of raw material.These Dryer and Generators are available in different specifications. 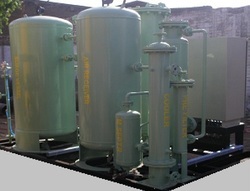 We offered all types of Air & Gas Dryers as well as Gas Generators with different capacities for different applications. Looking for Gas Generation Plants ?